The French in lieu of Mother Tongue (or French in lieu of Mandarin Chinese) is a special program for primary and secondary school students in Singapore who have been exempted from the mother tongue language (Mandarin, Malay, Tamil). French Faster has been providing the French in lieu of Mother Tongue (FIMT) program since 2007. Students include PRs and Singaporeans exempted from the mother tongue language. 1000+ students from various schools have taken our FIMT program which is approved by the MOE. Our French in lieu course is accepted by all local primary and secondary schools and the MOE (Ministry of Education) in Singapore. It falls under the category "French Tuition with a private tutor". Registration for French in lieu of Mother Tongue for 2019 is open THROUGHOUT THE YEAR! Students are required to attend 10 Classes per Term so that we can cover the MOE Syllabus. For 2019, there are 10 classes per Term so that our teachers can cover the MOE Syllabus and prepare students adequately for the compulsory MOE end of year exams at Secondary level. Old fees for 2016 (based on 6 classes per Term) in orange font below are NOT APPLICABLE in 2019. For FIMT Primary, per Term: 10 classes x 55min each. We follow the local Singapore school term (4 terms/year). Siblings can be put together ONLY IF they are of similar age and levels. All lessons must be pre-paid. Program runs throughout the year (4 Terms in a year). You can pay via online banking or direct deposit at an ATM machine to our Singapore bank account. Course Registration letter provided for submission to your child's school or MOE. We accept student registration anytime throughout the year. Registration for 2019 intake is open throughout the year. Register NOW to book your preferred slots for this year. The French in lieu program is delivered online with a private tutor. It is not pre-recorded video lessons. Lessons are delivered once a week, from Mon-Sun, anytime from 10am to 11pm Singapore. Each lesson lasts for 55 minutes for Primary and 1h25 minutes for Secondary. Students can choose their preferred days and time. We will let you know if your preferred slot is available and we will propose alternative days/time to you. Either the mother or father & child can attend this program. Parental attendance is optional. We especially recommend it for young learners (P1 and P2). Our French tutors are qualified native French speakers who bilingual in French and English. Our French tutors have good experience teaching French as a French language to children. We send you the French in lieu of Mother Tongue learning materials (pdf documents) before the lesson. 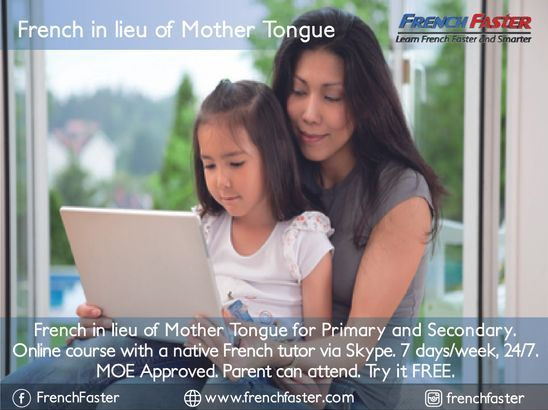 The French in lieu of Mother Tongue lessons are specifically designed for online learning. We will issue you Course Registration Letter after you have completed your registration through payment. The course registration letter (CRL) will be sent to your email as a pdf attachment. The CRL is a proof that your child is enrolled in our program. It is accepted by the MOE. Print out the CRL and submit it to your child’s school/MOE as proof of registration into our FIMT program. We issue Certificate of Attendance at the end of the School year (NOT at the end of each Term). As per MOE requirement, we clearly state your child's attendance for each Term. To register your child(ren) or book a free trial, click on the French in lieu Registration Form below. If you need the Course Registration Letter ASAP: Send us the Registration Form and make payment to our bank account (sent to you by email) while waiting for your trial lesson to be set up. We need a minimum 2-3 days advance notice to set up a FREE Trial Lesson. We can deliver classes Mon-Sun from 10am-11pm Singapore. If your preferred slot is not available, we will suggest other slots to you. Can Kids Learn Online ? Read our Student Reviews to find out! I just want to say thank you. My son enjoys his classes and he has a lot of fun during the hours of French conversation. "